He does it again. And again and again. Dale Humphries, aka Arcticology, has released his third album here on Earth Mantra, and folks we are just blown away. Entitled Deep Spring, this is a profound pure ambient release of remarkable depth and mystery. 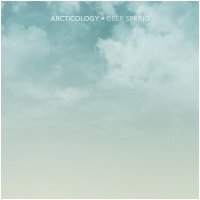 With all of the trademark Arcticology minimal lushness but reverberating with a vaguely bittersweet mood, this is an album that is sure to find its way onto your ambient playlist. Like his previous two albums, Dale's music floats along lazily under a silent and beautiful sky. Sure, there is a dark tinge off to one horizon, suggesting the possibility of some rain before long, but with Arcticology the rain is just another facet to the jewel that is this magnificent release. A bit shorter than his previous efforts, Deep Spring is nonetheless a tremendous release and well worth the time to listen to it end-to-end, particularly if one takes the time to prepare a proper listening environment (we recommend headphones, a darkened room, and delicate Japanese incense). All in all, a striking release by a truly gifted artist at the peak of his powers. Grab this one now. This music is like a thick lush cloud of psychosomatic goodness descending upon you.